If 2013 was all about the pixie, 2014 might bring back the partially shaved head. 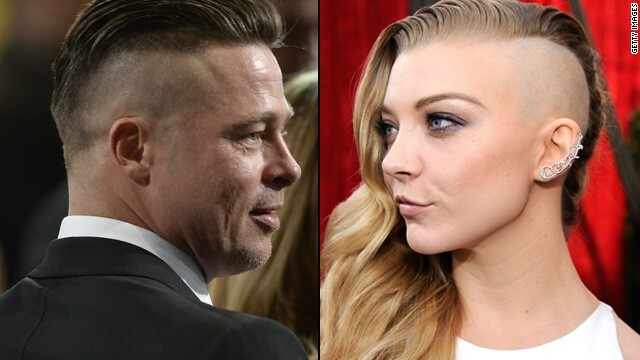 Both Brad Pitt and Natalie Dormer were sporting similar styles this weekend, with each star sporting a shaved head with just enough hair left for the look to be eye-catching. In Pitt's case, he took the razor to both sides of his head, leaving a tuft of long hair at the top. It's sort of like a mohawk, but one that doesn't extend all the way down the back of his head and doesn't have the strength to stand up. "Game of Thrones" and "Elementary" star Dormer went in a similar direction and debuted a new look at the SAG Awards on Saturday. While one side of her head showcased her familiar long blond locks, the other side was completely clean. Both stars, as it turns out, took the plunge for movie roles. Pitt wasn't specific about which upcoming film of his required such a cut - there's his upcoming war epic with Shia LaBeouf that's coming out in November, and a Terrence Malick drama called "Voyage of Time" - but there's no hiding what Dormer's new 'do is for. The 31-year-old actress has been cast as Cressida in both parts of the upcoming "Hunger Games: Mockingjay," and the cut is part of her character's rebel style. "It happened back in October," Dormer told Entertainment Weekly. "It's been hidden for three months. ... I was, you know, waiting for the right moment." « Previous entryLifetime's 'Flowers in the Attic': What's the verdict? They get paid quite well to sport that style. Doing it on purpose, that's another thing. Back in the 90s we called this a "Skater's Cut" on guys. Shaved in the sides and back, left long on top.